As fife and drum beat for Brexit, what happens next? For a moment it looked and sounded like a mini-twelfth. 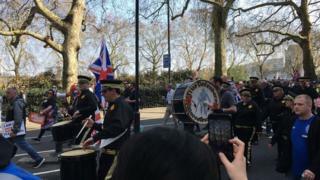 Two marching bands banged out some tunes on their flutes and drums, an Ulster flag flew overhead. But the big building in the background wasn't Belfast City Hall, but the Palace of Westminster. And the two bands didn't hail from Northern Ireland, but from Scotland. The accompanying protestors chanted "we want out" but as the long promised Brexit deadline approached, they, along with the rest of us, weren't getting out. Well not today anyway. MPs had just rejected Theresa May's proposed Brexit deal for a third time. Despite rumours of last minute backroom deals, the 10 DUP MPs trooped into the No lobby. Not for the first time, they argued that the backstop guarantee there should be no hard border posed a threat to Northern Ireland's place in the UK. Their East Antrim MP Sammy Wilson labelled it a "con trick". 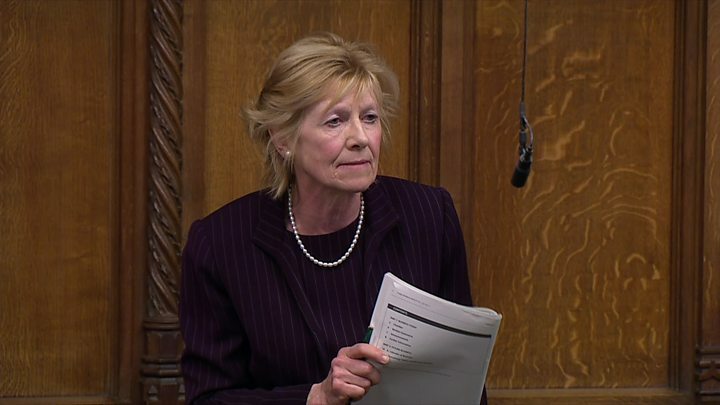 The North Down MP, independent Lady Hermon, reminded the DUP that they do not represent the majority in Northern Ireland who voted to remain in 2016. She rejects the argument that the backstop threatens Northern Ireland's constitutional status. Media captionLady Hermon says the constitutional position of NI remains "in the hands of the people of NI voting in a border poll"
What now? The DUP say the government must go back to the EU and demand the "backstop" is sorted out. However the chances of that request succeeding seem extremely slight. It's more likely the government will ask for a long extension which may require UK politicians to fight another European election in May. It's not inevitable the EU will say "yes" but both Leo Varadkar and Donald Tusk have made encouraging noises. Given how exposed the Northern Ireland economy, especially the agri-food sector, is to a no deal Brexit local businesses will be praying the government engages in a big push to avoid a disorderly exit on April 12th. Next week MPs will try to winnow down some alternative proposals to Mrs May's deal. A suggestion that the UK should stay in the Customs Union is proving popular, but it doesn't resolve many of the dilemmas posed by trade across the Northern Ireland border. The government will want to assess if some kind of hybrid mixture of Mrs May's agreement and these other ideas can be made to work. However once a long extension is in place, what will happen to public opinion across the UK? Will the anger of the pro-Brexit demonstrators who gathered outside Westminster on March 29th grow? Or will the demand for a fresh referendum, championed by a million people on the same streets just a few days before, get ever more insistent? Probably both will hold true in today's disunited Kingdom.